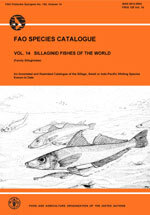 FAO species catalogue. Vol.14. Sillaginid fishes of the world (Family Sillaginidae). An Annotated and Illustrated Catalogue of the Sillago, Smelt or Indo-Pacific Whiting Species Known to Date. FAO species catalogue. Vol. 14. Sillaginid fishes of the world. (Family Sillaginidae). An Annotated and Illustrated Catalogue of the Sillago, Smelt or Indo-Pacific Whiting Species Known to Date. FAO Fisheries Synopsis. No. 125, Vol. 14. 1992. 87 p., 137 figs. This is the fourteenth issue in the FAO series of world-wide annotated and illustrated catalogues of the groups of marine organisms that enter marine fisheries. The present volume on the family Sillaginidae includes 31 species in 3 genera and 3 subgenera. Three species, formerly recognized as subspecies, are herein recognized as distinct species, one of them for the first time. This volume includes an introductory section with general remarks on habitat, biology, fisheries, systematics, zoogeography and problems of identification, a glossary of technical terms, illustrated keys to genera and species, including regional keys, detailed accounts of species, and a table of species by major fishing area. Species accounts include illustrations, scientific and vernacular names, references to scientific names, information on habitat, biology and fisheries, and a distribution map. The work is fully indexed and there is an extensive reference to pertinent literature.